Ross Browne has been editing books since 1992, and he’s been in charge of The Editorial Department’s editorial operations since 1998. While he still occasionally works hands-on with authors, Ross’s main role within The Editorial Department is managing the company’s day-to-day operations and helping our authors chart the most comfortable and efficient editorial course for their manuscripts. 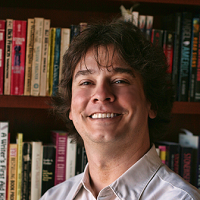 Ross’s 26 years of experience as an editor includes scouting talent for a major New York literary agency, developing a popular series of writer workshops, and working closely with hundreds of authors from first draft to final publication, as a developmental and line editor. His favorite writers include John Irving, Carl Hiaasen, Henning Mankell, Lee Child, Nelson DeMille, John Sandford, and Pat Conroy. (Also a fast-growing list of British and Irish mystery writers including Robert Galbraith, Tana French, and Susie Steiner.) He lives with his wife and son in Tucson, Arizona, and enjoys playing golf and watching baseball. As a guitarist, singer, and songwriter in several local bands, he is keenly interested in songwriting, studio recording, and biographies of influential musicians. He’s also an avid homebrewer and a founding partner in a company that designs equipment for the craft brewing community.